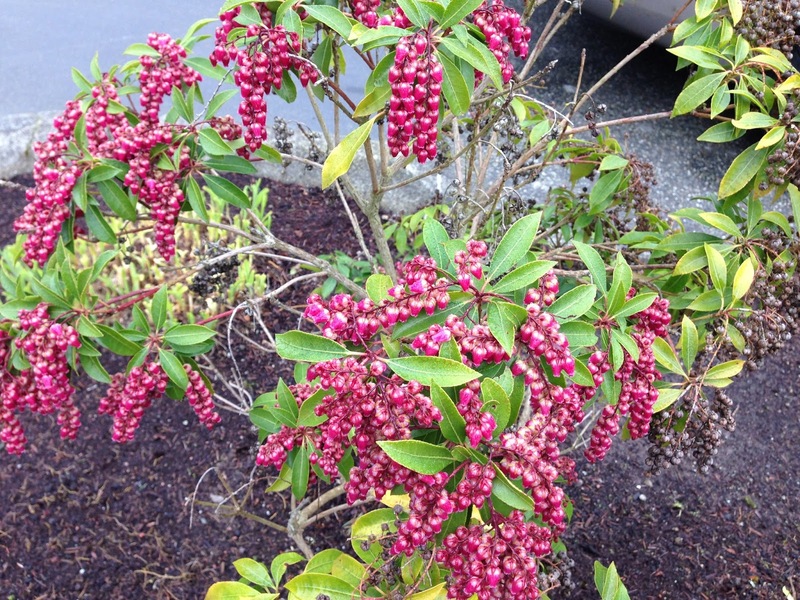 Guess what's happening in Bothell! Oh, you say, it's happening where you live, too? Imagine that . 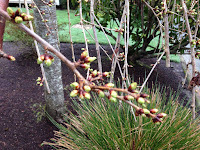 . . the surge of life pushing against the forces of dormancy and sleep, even death. Plants responding to increasing light, warmth, and length of days . . .is that why everyone I know is feeling a little punchy? More optimistic than usual? 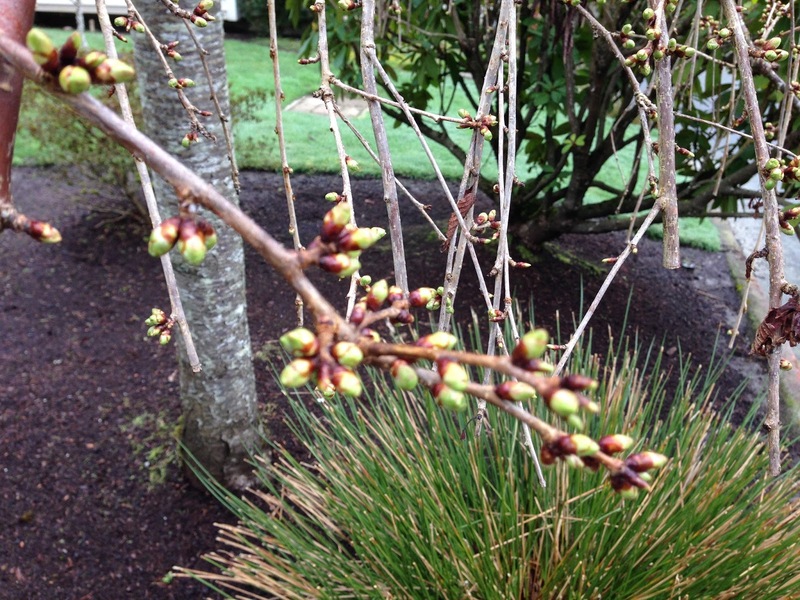 Maybe the promise of springtime activates a force in all of us, even old people. 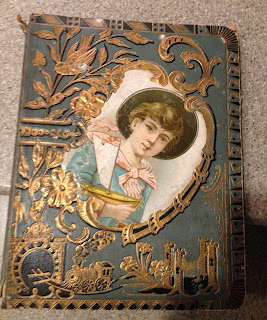 Recently I rediscovered a scrapbook from my dad’s family I’d almost forgotten about. 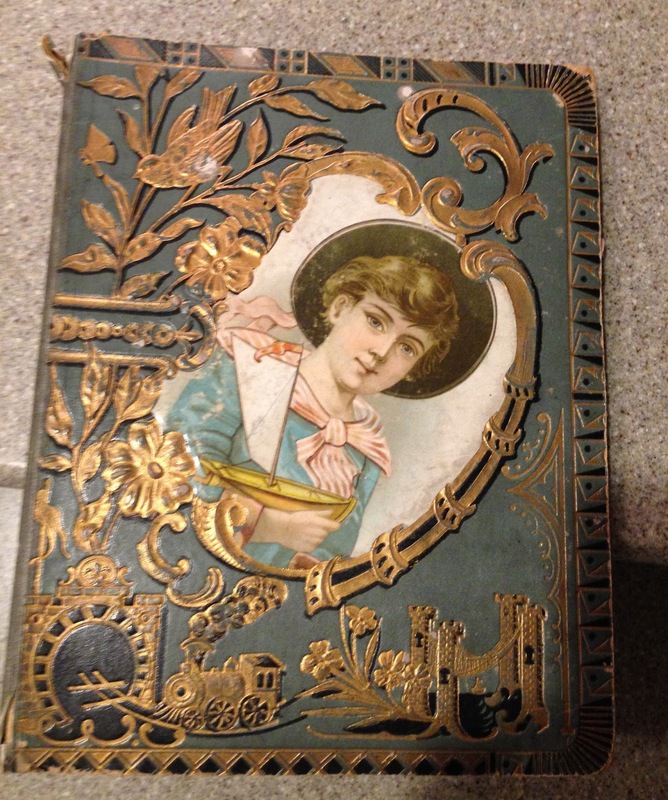 Although its cover depicts a young boy, circa 1900, holding a toy boat, it’s filled mostly with grownup and very dry topics from newspapers and periodicals. There are no photographs, just yellowed articles glued onto the pages. Few of the clippings have attribution—neither source nor date—maybe because the person assembling the items thought the topics were timeless. Occasionally, there’s a penciled date or a short comment written on the clippings. There're enough references for me to put a time-frame on the assemblage: 1906 through 1912. In addition to articles about economics, banking, and stock market, there are a few opinion pieces and charts of statistics. 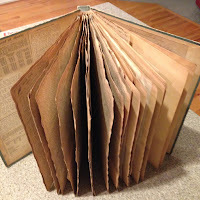 After all the pages were filled, the scrapbook owner tucked a few loose articles inside its covers, the latest one carrying a date of 1919. It’s a strange collection, and I’ve always assumed it was my paternal grandmother’s doing, probably begun during her pregnancy with my dad—her one and only child. Today, however, as I paged through it in wonderment, admiring how well the century-plus old clippings had held up (despite a deep yellowish color), I had a breakthrough thought. This album was made by my grandfather, not my grandmother! This book is the legacy of man—specifically a banker—for his firstborn, his descendant. It is a man’s expression of hope for his infant son, a man’s dreams that his son will develop good character and an interest in his father’s industry. It is a man’s attempt to assure his descendant will uphold the family name. Knowing what I know about my grandfather, I’m positive my deduction is correct. Charles Wesley Johnsone (Charley) was forty-seven years old when my dad (his only child) was born in Ellensburg, Washington. 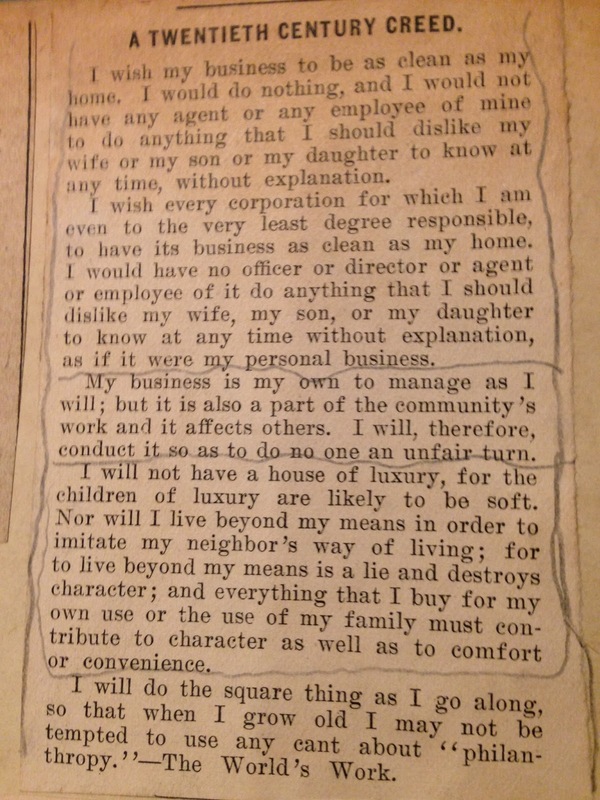 Grandfather, who was born in 1860, had earned civic esteem and success through ferociously hard work. Leaving his Iowa home in 1874 after completing eighth grade, he headed west by getting a job on the railroad and worked his way up to the position of fireman. After losing a finger in that dangerous position, he settled in Centralia, Washington, where he eventually ran a pharmacy. Ever the entrepreneur, he moved to the geographic center of Washington, Ellensburg, in the mid-1880s in anticipation of the territory attaining its 1889 statehood. There he found his niche in the banking industry. By the time my dad was born in April 1907, Charley Johnsone was an icon of success and fiscal responsibility in Ellensburg where he had established Washington National Bank and served as its president until his retirement in the '30s. Clearly, he took very seriously his new responsibility of parenthood, determined to educate his son in the ways of hard work and humility—the upright life, and one that included banking. It would seem he began that education right away with a scrapbook chock full of sage advice (and plenty of banking articles). Charley succeeded in swaying his adored son to follow in his footsteps. My father was a member of the banking industry his entire working life, from his first job as a bank examiner during the depression to organizing a national bank to heading an international banking department at the time of his death. Many of clippings in the scrapbook have little or no relevance for today, at least not for me—they follow various banks in the nation at that time and address specific situations with the banking industry in the early 20th century. 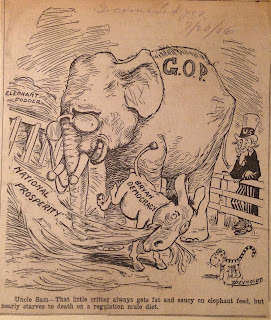 But there are several fascinating editorials: one about the gold standard, another about Lincoln’s influence (my grandfather was a huge fan), and speculations, such as whether banks can intentionally start a run on stocks. There are summaries of bank assets by county, several items about Masonic events (yes, my grandfather was a Mason), and a few poems by unknown authors that he clearly liked—they have been marked up in pencil—on the theme of staying true to oneself and exercising frugality, even if one has means. There’s a chart about how men view life in terms of saving money and the progression of fiscal conservatism that should ensue with each passing decade. 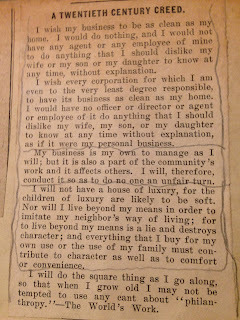 My grandfather was definitely documenting his ideals for his young son. 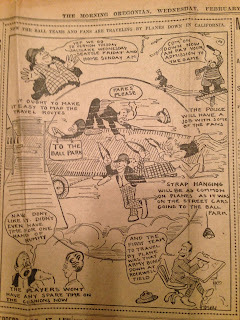 Two of the items loose inside the scrapbook were a political cartoon from 1906 and another cartoon on the flight industry from 1919. 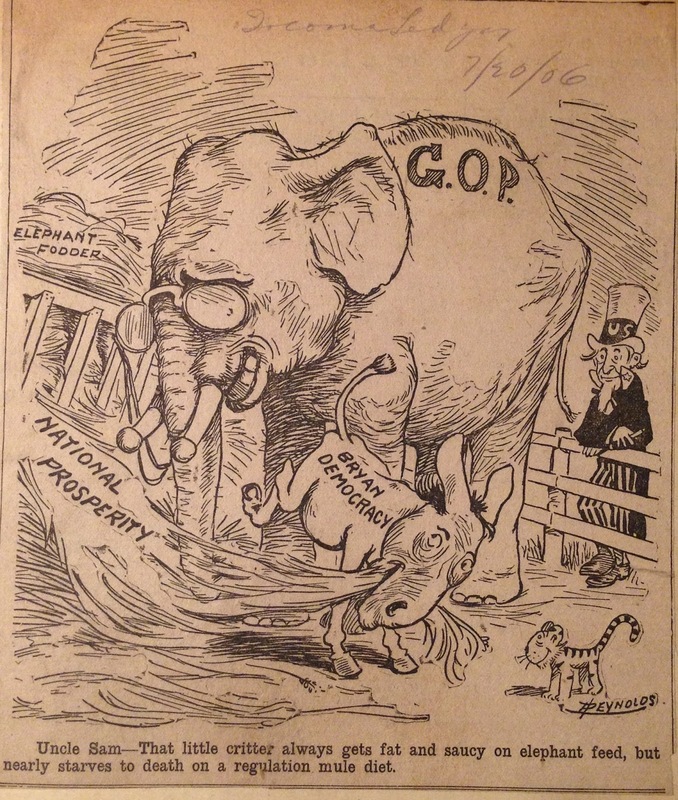 The first reflects my grandfather’s political leanings. After all, it had been just forty-one years since his idol, President Lincoln, had been assassinated. Not surprisingly, he was a Lincoln Republican. 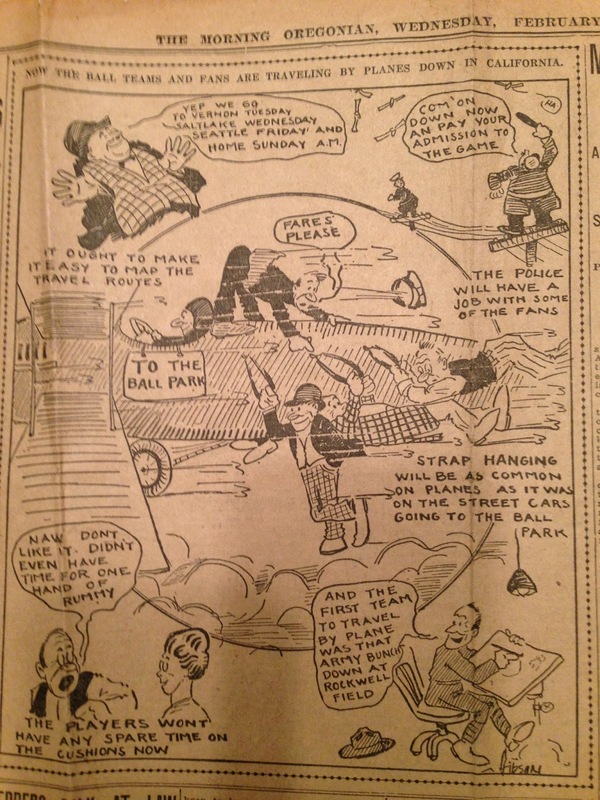 The airplane cartoon bears the latest date of all the clippings, the only one less than a century old. However, considering it appeared just sixteen years after the Wright brothers’ flight, I found it quite remarkable. Grandfather Johnsone died in 1943 when I was a toddler; I have no direct memories of him. Yet his scrapbook provides a glimpse of him, this serious, earnest, self-made man. His enormous collection of history books, especially about the wild west, is another way I’ve come to know him, but that’s for another blog post on another day. Yesterday I was part of a crowd, standing in the rain on a golf course and applauding speeches. Why? 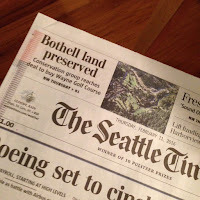 Because fourteen months after its inception, a group known as OneBothell was triumphantly celebrating its goal met, an achievement affecting generations to come. 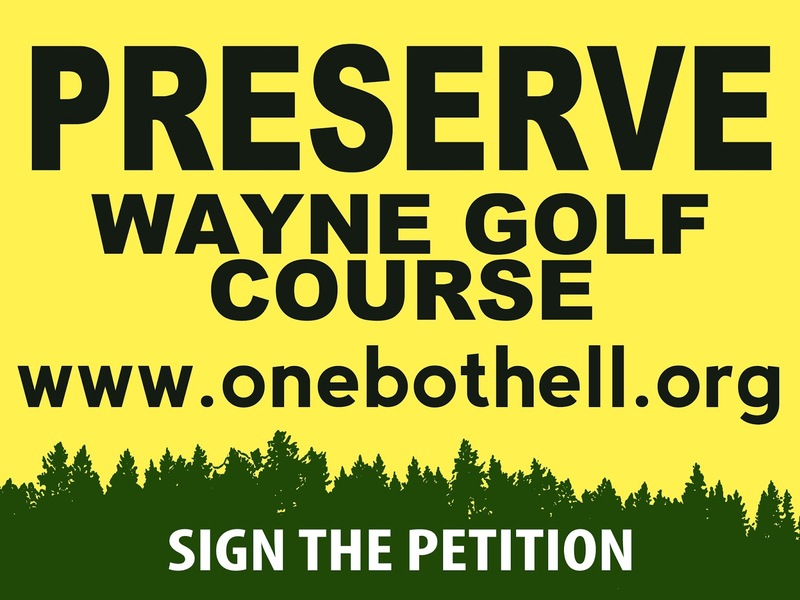 Wayne Golf Course, an open-space of nearly ninety acres in the heart of Bothell, has been saved from development at the instigation of OneBothell. 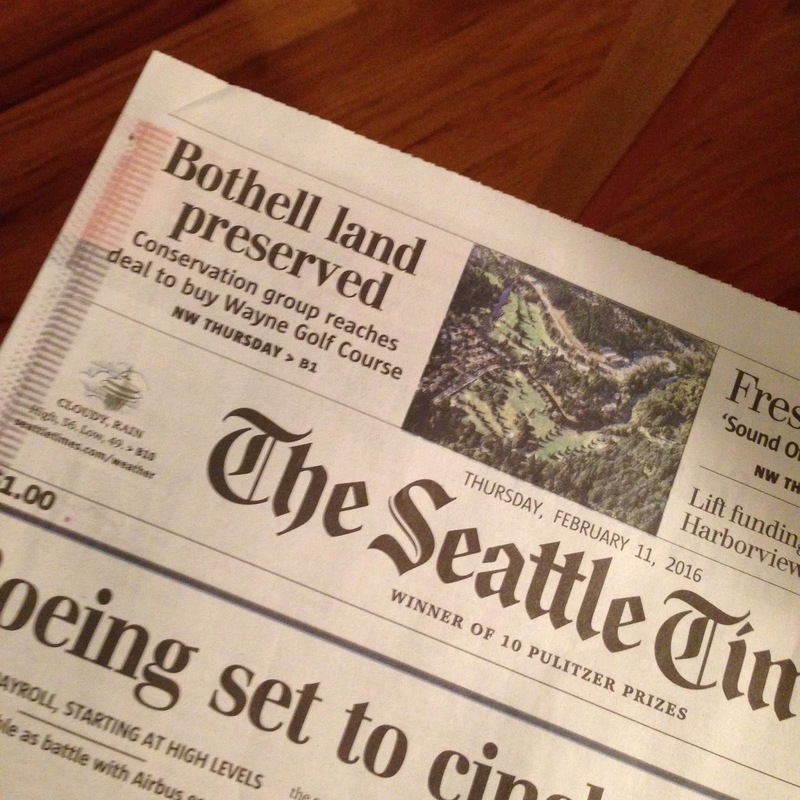 Through a complex interim ownership agreement with the conservation organization Forterra, the community has three years to apply for and receive grants, as well as solicit private funds, to cover the $12 million price tag. This was a dream and a longshot, a hope and a plan, an endeavor that succeeded beyond all odds. 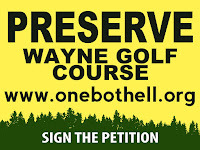 I stood on the golf course while Jesse Sears, the president of OneBothell, thanked Forterra for ‘making it happen,’ and I listened to James McNeil, former president of OneBothell and city council member, thank many individuals for ‘making it possible,’ and I watched Jonty Barnes with a child sitting on his shoulders listening with joy spreading across his face. It was a thrilling and victorious occasion for the (at least) 150 people present. But one thing was missing from the tributes —very missing in this woman’s opinion—and that was the HUGE THANK YOU deserved by JESSE, JONTY, and JAMES, the three extraordinarily humble men whose vision drove the entire endeavor. You three can applaud Forterra, rave about Rod Dembowski, praise the ultimate decision by Joshua Freed, and that's great . . . but it is YOU three who deserve shouts of praise for your focused and wonderful vision that drove the winning outcome. Here's to the Three Js, as OneBothellites affectionately refer to them. I mean this tribute to be equivalent to a standing ovation for you! Hip, hip, hooray! I'll begin by apologizing for the inferior photo, but it's too funny not to share. 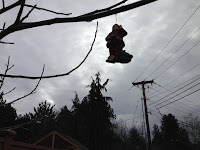 While on my 'regular' Sunday morning walk--up a hill for one mile, then down again--I looked up for whatever reason and noticed something on a tree branch overhanging the sidewalk. A Christmas ornament! 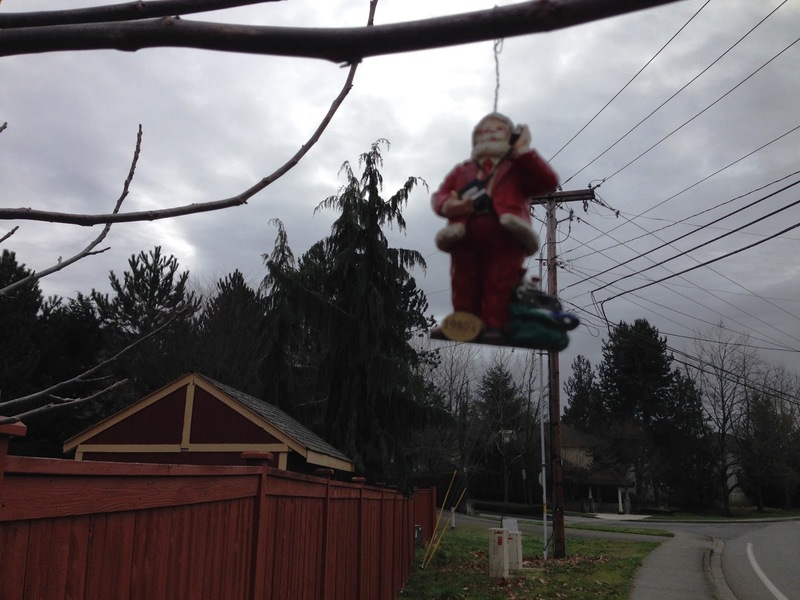 On closer look, I realized it was Santa on a cell phone. The whole notion got me giggling . . . is he lost, trying to find an address? Is he telling his wife about an adventure he just had on someone's roof? Or is he taking a frantic call from someone back at the North Pole--someone who needs to tell him something that can't wait (I just got a tearful call from a mom to say you delivered the wrong thing)? Maybe someone is relaying an unexpected event that just happened (there's a scary noise coming from the reindeer barn). Whatever the reason, I found it a delightful touch of whimsy on an otherwise routine outing.